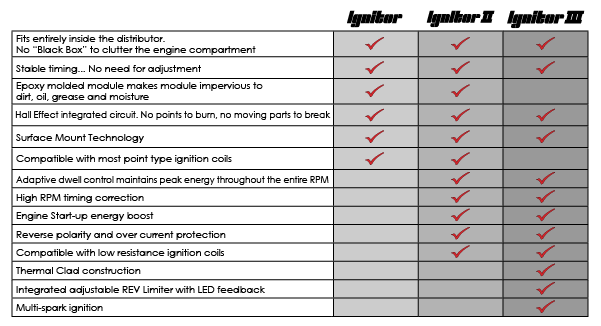 Want to know if there is an Ignitor available for your vehicle? Simply fill out the online Pertronix Enquiry Form and we will get back to you with an answer, usually within two days. Please ensure you include as much info as possible regarding your current distributor and points, as without it, we may not be able to match a kit for you. The button below will open our standard Application Guide pdf which may tell you if we have an ignitor available for you. We recommend if you are installing a Pertronix Ignitor Kit for the first time, that you always purchase a Flame-Thrower® Coil at the same time, to ensure you get the most out of your new Electronic Ignition. Have you got one of these popular models? If so, check out our Pertronix Australia Online Ebay store which always has these kits in stock, as well as Kit & Coil packs, which will save you on postage. If purchased and paid for prior to midday (AEST) on a weekday, they are usually shipped the same day. Pertronix Australia have been importing Pertronix Ignition Kits and Coils into Australia for over 22 years, and assisting car enthusiasts and mechanics in improving engine performance and reliability, using these products which are of the highest quality, with confidence. Pertronix Electronic Ignition systems are the perfect replacement for points and troublesome factory ignitions with a dependable, self-contained and maintenance free electronic ignition system, which fits completely inside your distributor, so you can keep that 'stock' look in your engine. Pro Quip is the only authorised distributor throughout Australia and New Zealand of the Pertronix Performance Products range. We recommend that installation of these products only be carried out by a Qualified Automotive Electrician, as incorrect installation which damages the unit will void your warranty. Note: We will ALWAYS Recommend that you replace your old coil with a Pertronix Flame-Thrower Coil when installing a Pertronix Ignitor Kit. It is the only way to guarantee that you will get the BEST performance from your engine!